Like most millenials, my absolute favorite social network is Instagram. 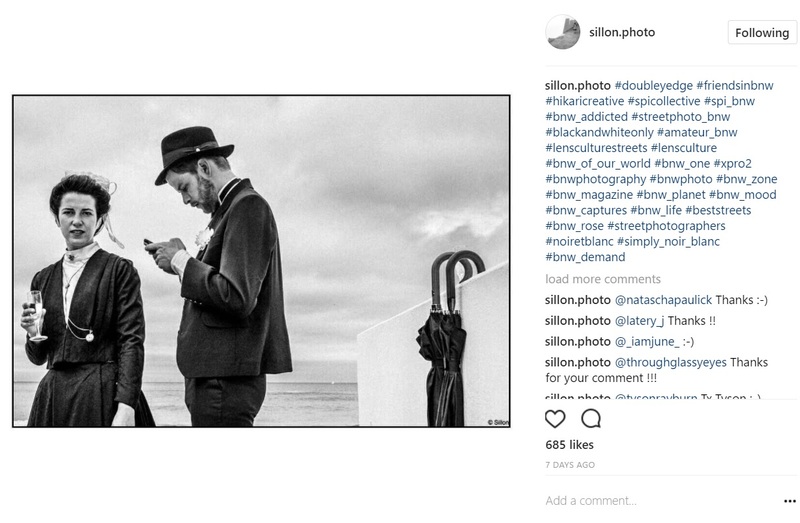 Fewer ads and less written text means a lot more focus on individual images, making Instagram a great place for seasoned street photographers to showcase their work and amateurs like myself to find inspiration. Of course, you still have to sift through a sea of hashtags and friends of friends of friends to find the artists that really touch your heart and soul with their images. 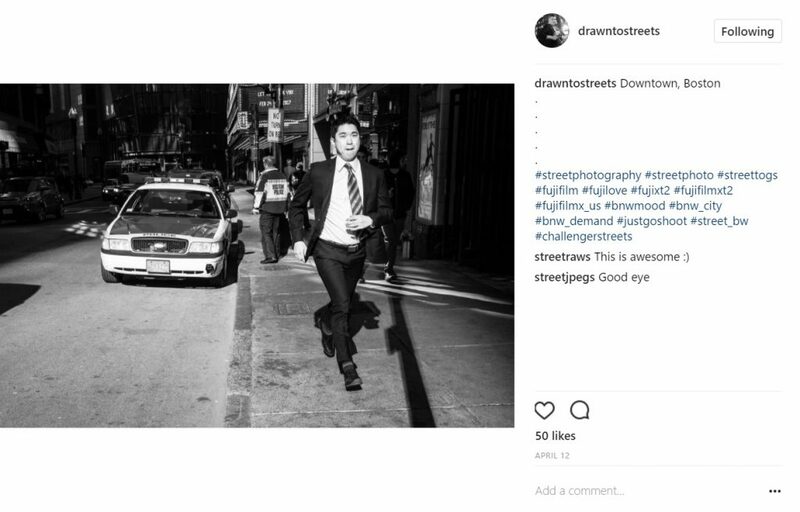 So in hopes of putting you on the fast track to inspiration, I’m sharing a list of my 10 favorite, lesser-known (as in they don’t have 20k followers…yet) street photographers on IG, in no particular order. They aren’t my only favorites, but I didn’t want to get too crazy with this list so 10 is all you’ll get today. Here goes nothing! 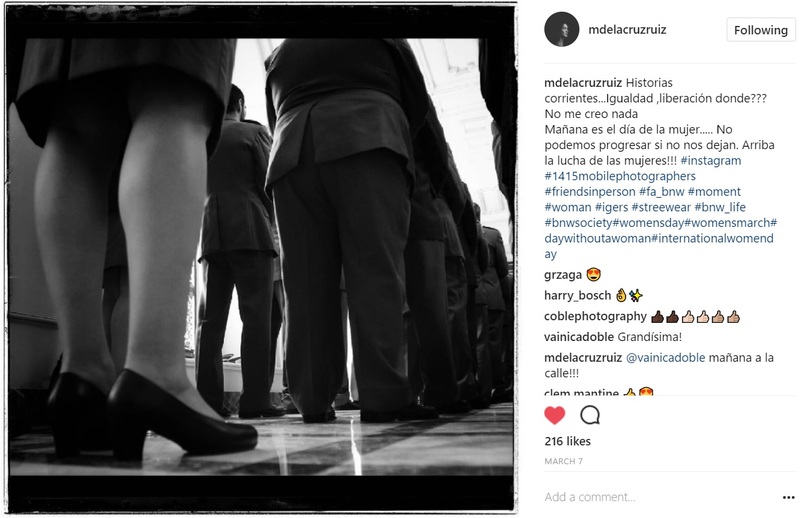 @barbaradimaio_photo – Barbara is a globe trotter who lives between Italy and the U.S. She’s the kind of photographer that captures stories up close and personal, sometimes in the smallest details. Her images come in B&W and color – both equally captivating. 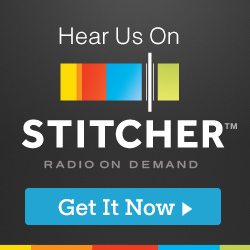 Visit the link and see for yourself, I know you’re going to give her the follow. 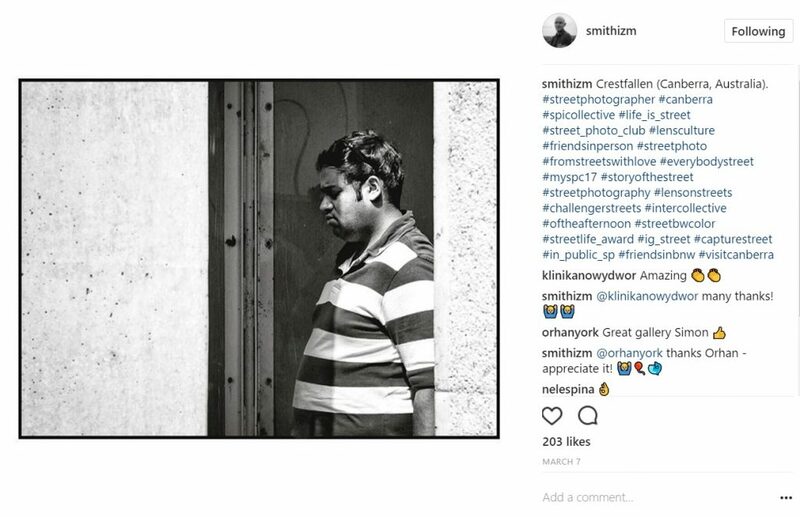 @smithizm – Simon is a traveling photographer who lives in Australia. His feed is a mixture of light, shadows, contrasts, colors and most importantly, the human element. Simon captures his subjects in a way that makes it easy to imagine what they are feeling and even to relate to them, no matter who they are or what they are doing. 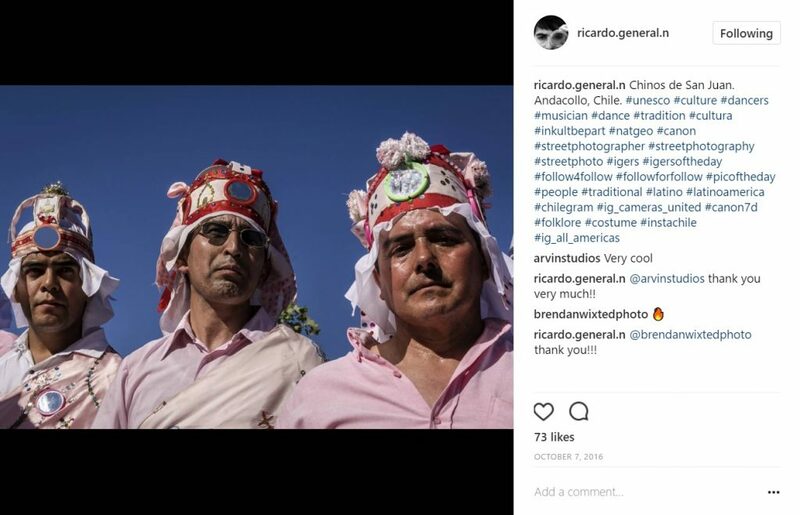 @ricardo.general.n – Ricardo’s images are always full of life and shot from angles that make you feel like you are in the scene. Vivid colors and extensive travels make his images real eye-catchers. Truly, you’ll be compelled to pause your scrolling to soak in all the glorious details of each of his images. @sillon.photo – Glorious minimalism! I love this B&W feed by French photographer, Sillon, and I’m sure you will too. I find the use of light and shadows along with special attention to shapes and patterns refreshing and inspiring. This feed will teach you to spot beautiful geometry and incorporate it into your images. 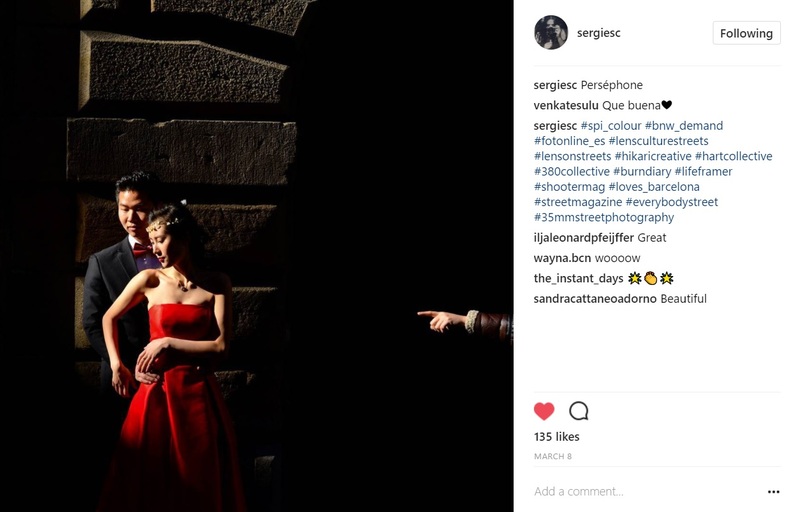 @sergiesc – Sergi is a freelance photographer who loves capturing those moments of sharp contrast when the sun really starts beaming down. His use of “harsh light” to create contrasts and sometimes conceal his subjects’ identity gives his images a mysterious and dramatic element. @drawntostreets – Mikk captures people being people. Even though he may not be shooting your city, his images feel like home. His composition and use of light are both pretty amazing too. @sagi_k – Sagi is an “observer of life” and his images show it. Bright colors, up close black and white shots, people doing normal things, people doing weird thing, this account has it all and it’s all shot oh-so-nicely. @eva_depoorter – Eva never disappoints. Timeless shots from all over the world in black and white makes this one of my all-time favorite accounts. 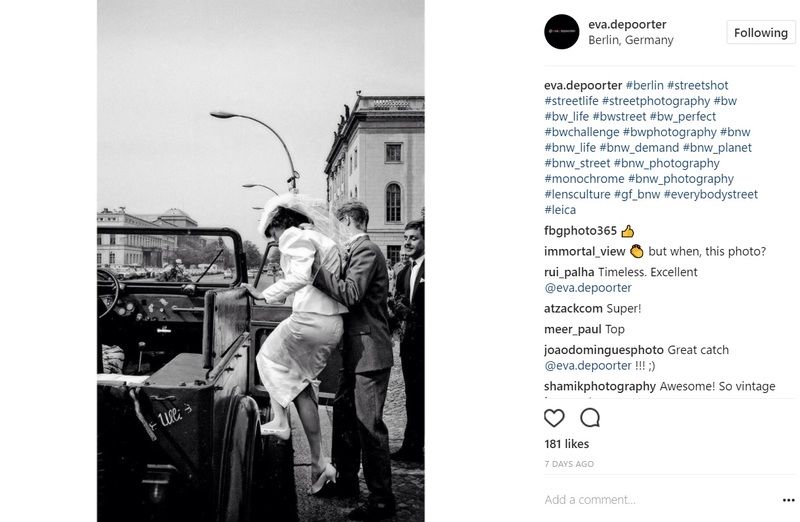 Eva has a classic style that I find quite inspiring and I think you will too. It’s easy to see she has a way with people in her many portraits, which have a natural, upbeat feel. @mdelacruzruiz – Maria is your go to source of inspiration if you are working on your storytelling skills. She captures stories in the everyday scenes that often feel slightly documentary in their style. Her feed is full of, as she puts it, “historias corrientes” or ordinary stories but I can assure you, you’ll be amazed at the effect those ordinary stories will have on you. 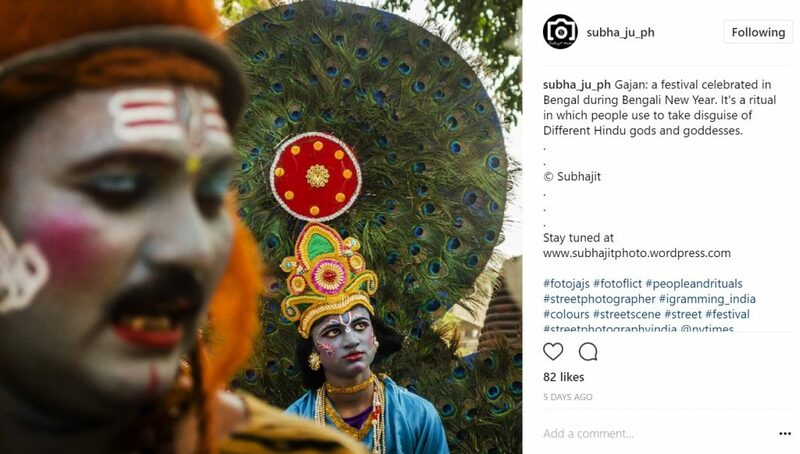 @subha_ju_ph Every street photography filled feed needs a little India and Subhajit has the perfect feed to give you a unique glimpse into that colorful country. His images are raw and human and cheerful, giving you a realistic view of the people and culture in his area. Even if India is half a world away from you, you’ll feel that twinge of familiarity as you look into his subjects’ eyes. It’s a beautiful thing. So there you have it – 10 amazing Instagrammers you should definitely add to your feed for inspiration, motivation and plain old aesthetic pleasure. And before I sign out of course, a little shameless self promotion – Be sure to follow Street Photography Magazine’s IG account too (@streetphotomag). We curate all kinds of images from the magazine, the blog, our Flickr group and fellow photographers on Instagram. 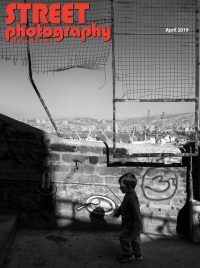 It’s another great way to find top-notch street photography feeds and sometimes we do contests too! Who are your favorite street photographers on IG? Shoot me an email with your favorites if you want, you can always reach me at ashley@streetphotographymagazine.com. 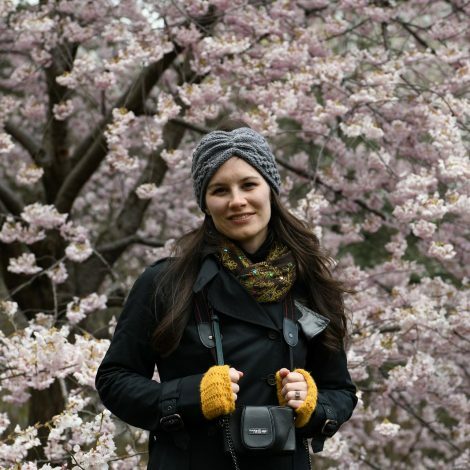 Geographically unstable freelance writer and amateur street photographer with a love for experiencing and documenting new places, peoples and cultures.